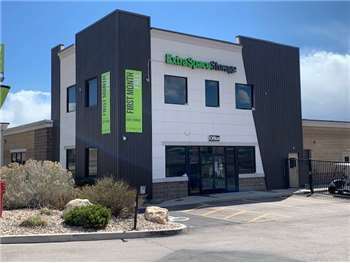 Located on N Thanksgiving Way north of the Club House Dr exit on I-15, Extra Space Storage serves residents of Lehi. Locals will recognize our facility near Mayflower Harbor Apartments. With a wide selection of storage units, climate-controlled storage, and exceptional security, Extra Space Storage on N Thanksgiving Way is the convenient storage option for you in Lehi! Our Lehi storage facility offers units ranging in size from 5x5 to 15x30 with features like indoor access, first-floor access, and drive-up access. We have the storage space you need! The safety of our customers and their belongings is our top priority. That's why our N Thanksgiving Way storage facility is equipped with security features like an on-site resident manager, 24-hour video surveillance, individually-alarmed units, and electronic gate access. When storing delicate items, climate control is highly recommended. This feature keeps your unit comfortably between 55? and 80? at all times, protecting sensitive belongings from extreme cold and heat. Climate-controlled units are available in sizes 5x5 to 10x20. Moving items in and out of your storage unit is easy with drive-up access! This amenity allows you to pull a vehicle right up to your unit for quick unloading and loading. Drive-up units are available in sizes 5x5 to 15x30, and some can even be used to store cars, motorcycles, and other small vehicles. Not only does Extra Space Storage maintain a secure, clean facility at all times, but we also have a friendly, professional staff dedicated to delivering exceptional customer service. We'll go the extra mile to ensure you have an incredible self storage experience with us. Contact us today to reserve a storage unit in Lehi! Great price great customer service! Clean environment and very secure. Friendly and helpful staff. 4 stars because it seems to be more expensive than other facilities. Easy and Convenient, Customer service was great!! A very clean and organized business. I feel completely at ease storing my personal belongings with Extra Space Storage. The customer service is amazing and all the staff will do everything they can to meet your needs. Jace and Kari in the Lehi office both went above and beyond to make this the best experience possible! This is a high quality storage facility. I was very impressed by the cleanliness of the place, the ease of finding the storage units, and the friendliness of the staff! The general management at Extra Space Storage is terrible. The online accounting was constantly incorrect and my bank account was debited without my permission on 2 separate occasions. My unit was locked by management when I was only 13 days late and then they claimed that I was 90 days late. Do not trust these people with any of your banking information. Pricing for the units is higher than anyone else in the area. My price went from 90/month to 129/month over a little more than 2 years. Fraudulent practices abound at ExtraSpace. I was disappointed when I returned to my storage bay after one-year to find everything inside covered with a thick layer of dirt. I complained to management and they gave me $25 of one-month's rent, but that hardly covered the trouble of the layer of dirt. We vacated the storage unit and had to spend quite a bit of time cleaning our belongings. Before renting at the Thanksgiving Point facility, I would make sure the seals on the door are good. Also in just over a year we had to rate increases which seems a bit much. So here's the thing...I have never rented a storage unit before. I have been around storage facilities with friends and family over the years who have rented units and always thought they were dirty, uninviting and not very secure. I recently needed storage for some items that I just could not keep in my apartment. I asked for an affiliate referral from on organization of which I am a member and they recommended that I try Extra Space Storage. They gave me a phone number to contact them. I called the number and was greeted by a very friendly and helpful person on the other end. He quickly answered all of my questions explained my options and the costs involved, and in a matter of minutes had made me feel confident enough to make a reservation for a unit. A few minutes later I received a call form the Local property manager confirming my interest, my reservation, the size and details of the unit I needed and an appointment to view it and finalize the deal that evening. WOW! How convenient is all of that? He even offered to stay late to meet me if I needed him to since I get off form work later in the evening. Amazing! When I arrived I was extremely impressed with the welcome that I received form the property manager. He took me to the unit I would be renting to make sure that it would suit my needs. I noticed along the way how extremely clean, well lit, and well maintained the entire property was. Again, just amazing! The unit was perfect, the security was paramount and the whole experience just felt great. All of my questions were answered the deal was finalized and I was ready to move in. The whole experience could not have been a smoother more pleasurable experience. The other amazing thing about all of this....I can't believe how well I sleep at night knowing that my items are stored away safe and secure at Extra Space Storage! Thank you Extra Space Storage! I would recommend this company to anyone who is looking for storage solutions! Extra Space Storage was very helpful. They helped me choose the best storage space to fit my needs. Good rates, helpful staff, and respectful. Love that it is month to month. Also like the security and climate control options. Location is close to the freeway and easily accessed. Excellent service friendly caring great location great hours good prices this manager excellent. This manager also signed me up at another location also. I do recommend extra space storage. Thanks for the perfect service Thanks. Secured location. Starting on I15 exit on the Highland/Alpine exit. Turn west off of the exit. Pass the Maverick on the right. Turn right at 1st light. Follow Thanksgiving way. We are between Rod Works and Younique. Starting on I15 exit on the Highland/Alpine exit. Turn west off of the exit. Pass the Maverick on the right. Turn right at 1st light. Follow Thanksgiving way. We are between Rod Works and Younique. On the west side of the road. Starting on Timpanogos highway (Utah state route 92) Head west. Pass under the I15 exit and on ramp. Pass Maverick on The right. Turn right at the 1st light. Follow Thanksgiving way. We are between Roadworks and Younique on the west side of the road.